If you’re out researching oxygen therapy, it’s likely that you are on oxygen and don’t like the solution you currently have. Most patients who are on oxygen start out with the solution that has been "provided" for them without really knowing all of the alternatives that are available. We understand how confusing this can be. Well, take a deep breath and continue reading. Below we’ve compiled an easy guide to help you understand your alternatives including Medicare, Medicaid, supplemental insurance, financing options, and more! First and foremost you’ll need to understand your medical requirements. When you were first diagnosed as needing oxygen therapy, you were likely provided a solution that included a large home or "stationary" unit for use at night and when you are at home as well as oxygen tanks for excursions outside the home. These units should have been set to a prescribed level (typically measured in liters per minute of oxygen flow). These settings, as well as your prescription, will help our oxygen experts understand exactly which units will best meet your medical needs. The good news is that there are more options for oxygen therapy available to you than the standard issued home (stationary) concentrator and oxygen tanks. We have compiled excellent information below regarding the innovations in home concentrators as well as alternatives to oxygen tanks – the portable oxygen concentrator. Portable oxygen concentrators (or POCs) have been on the market for almost 20 years. They operate the same way as a home concentrator in that they are able to take air and convert it into medical grade oxygen. Portable concentrators were designed to provide patients with more freedom than a tank. The biggest benefit is that a POC will never run out of medical grade oxygen, is generally small and light, and does not require any refills – only a power source. Portable machines can vary greatly in oxygen generating capacity, size, battery life, and cost. As a quick review, a stationary concentrator is designed to provide a patient with medical grade oxygen while in the home. They run only on AC (wall outlet) power. These units are robust and typically kept in a central location and operated from within the home environment with a long tube (up to 50 ft) providing oxygen to a cannula. Many of the older units can be loud, energy intensive (often over 600watts) and heavy (some are over 50 lbs). The typical home concentrator has settings from 1 liter per minute to 5 liters per minute of oxygen flow. The good news is that newer technology has improved on all of the key features. Units are much quieter (up to 15 – 20 db quieter), more energy efficient (some as low as 200 watts), and much lighter (as light as 10 lbs). How to determine what POC is right for you? Our trained experts will ask questions to help understand your needs and then walk you through an easy selection process. But first, there are a few key factors in selecting a POC. This is the most important aspect of your selection because it insures your medical needs will be met. It is important that you know and understand both what your medical requirements are as well as what any POC you consider can provide. Most oxygen being delivered is prescribed in liters per minute (lpm) of continuous flow. The most common flow setting is 2 lpm with about 70% of oxygen users on this setting. Newer technology POCs disburse the oxygen is something called a “pulse dosage” (or pulse dose). In pulse mode, a small bolus (or puff) of oxygen is delivered via the cannula every time a patient takes a breath. Most equipment has pulse settings of 1-3 or 1- 5 etc. A range of settings allows a patient to adjust the dose to fit their exertion levels. Our oxygen experts will help make sure the size unit chosen will fit your needs. Most people will have a selection of units that will meet their medical needs and they will be able to select from a group of units the ones that will best match their lifestyle. POCs can range in size from as small as 2 lbs to as large as 18 lbs and everything in between. This range opens up a wide range of activities – for instance the lightness of the 2 lb unit is best suited for light exertion daytime use while at the other end of the scale, the 18 lb unit is the most powerful on the market and good for 24 hour use. Portable units provide patients with freedom but they do require a power source. All of our POCs run on 3 types of power: AC (wall outlet), DC (car cigarette lighter) and Batteries. One of the distinguishing factors between portable units is their style and longevity of battery life. Some units have an internal battery that lasts an hour and other units have batteries lasting up to 8 hours. Most batteries are lithium ion rechargeable batteries. Battery life varies with both the unit and the setting the unit is being run on. Ask our oxygen experts to help explain the battery life tables for the units in which you are interested. Not surprisingly, the cost of POCs can also vary greatly. Like most electronics, the newest and smallest technology is typically the most expensive. Alternatives do exist however and there are several high quality units available across a range of prices. Additionally, as portable concentrators have become more popular, we have been able to offer our customers gently used products at a more attractive price point. New POCs roughly run from $1,800 - $4,500. Used units can be typically found between $995 - $2500. Used home units can be found from $499. If you currently are on oxygen therapy, it is likely that your current oxygen solution was covered under Medicare, insurance, or a combination of the two. The most common question we get is, “Will Medicare cover the purchase of a new POC?” In order to best help navigate this question, we have created the following tutorial. We know it is confusing, so feel free to call and talk to one of our oxygen experts. Will Medicare cover the cost of my POC? It seems like there should be a simple YES or NO answer to this question but unfortunately there is not. The best way to explain the situation is to start with a few facts, and then a few FAQs. Medicare coverage for Oxygen Therapy Equipment is provided via a long-term (5 year) monthly rental contract through a Medicare provider. Medicare pays providers a monthly FEE for providing patients with oxygen. A Medicare provider is required to provide a patient with a solution for within the home (home or stationary concentrator) if the patient only needs oxygen at night or a home concentrator and a portable solution (i.e. tanks or POC) if the patient needs oxygen 24 hours a day. A Medicare provider is NOT required to provide a patient any particular equipment and specifically, does not need to provide a patient with a portable oxygen concentrator. The most common solution is a stationary “home” concentrator and refillable oxygen tanks. Medicare does not reimburse for any out-of-pocket expenses and Medicare will NEVER pay for the PURCHASE or short-term rental of an oxygen concentrator. Many supplemental insurance companies WILL cover some or all of the PURCHASE or RENTAL of a portable oxygen concentrator. Based on these facts, it is our recommended action to always start by talking to your current Medicare or Insurance provider and see if they will provide you with the equipment you are looking for. I heard from a friend that their Portable Concentrator was covered by Medicare. There are situations where a patient has been provided a long-term (monthly) rental of a Portable Oxygen Concentrator via Medicare (typically new patients). If you are currently under contract for oxygen with a Medicare provider, you should ask your CURRENT MEDICARE OXYGEN PROVIDER if they will provide you with a Portable Oxygen Concentrator. They may be willing to provide you with a portable oxygen concentrator. My provider says they CAN NOT/WILL NOT provide me with a Portable Oxygen Concentrator. This is very common, as Medicare re-imbursement has declined. Many patients are learning it gives them freedom to PURCHASE their own portable oxygen concentrator while maintaining their Medicare provided solution as a back up. So how do I get a Portable Concentrator? For those who are tired of dealing with a bureaucratic government agency and providers that do not seem to listen to your needs, AMSR provides the perfect alternative. AMSR offers out-of-pocket purchase and short-term rentals for oxygen concentrators. We also offer rent-to-own and easy financing solutions (PayPal Financial) for qualified applicants. My insurance is paying for my unit but I have a large co-pay, what should I do? 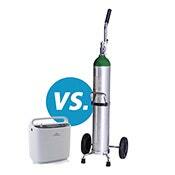 It is not uncommon for people to make co-payments on oxygen equipment that are fairly large. If you are currently making a co-payment over $50/ month, it will make sense for you to talk to one of our specialists. Many times the outright purchase of a unit can pay for itself in as little as several months. Will my supplemental insurance cover this? They might! Many supplemental insurance companies will cover some or all of the purchase or rental of a portable oxygen concentrator. It depends on the insurance provider, of course, but many have their own requirements and qualifications. It is best to call your provider and inquire what kind of coverage your plan offers for an oxygen concentrator. The vast majority of our patients have Medicare or Insurance coverage of some kind but have opted for regaining their freedom by purchasing their own oxygen therapy equipment. Purchasing out of pocket puts you back in control and allows you to choose the right unit to fit your needs and lifestyle! If you’ve decided to purchase out-of-pocket, keep in mind, many people are still eligible for some re-imbursement from insurance (not Medicare) and there are also options available for the budget conscious patient. Always make sure the unit being sold will meet your medical needs. While the smallest and lightest technology may be nice, your medical condition may require a different unit. The sale of all concentrators legally requires a doctor’s prescription. If a prescription is not required for purchase, you are likely not dealing with a reputable dealer. Check Reviews and Better Business Bureau reports. It should be a red flag if a business is not minimally accredited by the BBB (with a history that matches what is stated on the website). Unfortunately there are many websites that "look" like sophisticated operations but are really small operations working out of a garage. Low prices, limited time offer sales and fast-talking are sure red flags. Keep in mind, you want to make sure you are working with a reputable dealer that will make sure you get the correct unit and be there to help you if the unit fails. Try before you buy – any reputable dealer will provide you with an opportunity to use and try the unit without penalty. Never order a unit that cannot be returned if the box is open. Understanding the real story on warranty – talk is cheap on what happens if your unit breaks and sometimes retailers offer bogus warranties. We can help you sort out the truth from the fiction. More importantly, we stand behind the products we sell and we can show you how we do this. If you need oxygen therapy for a short-term trip or excursion, renting is a wonderful option. Both home and portable concentrators are available for weekly (or longer) rentals. We have an extensive retail fleet and all of our POCs are FAA approved for travel on airplanes. Renting an oxygen concentrator is also a great way to test out the machine before you purchase it. If you end up liking the unit you’re renting and are interested in purchasing it, simply keep the machine. We’ll apply the cost of the rental toward the purchase price! Only buying equipment from an authorized dealer who can insure the unit does meet specifications. What a bummer it would be to buy a concentrator that is not functioning or does not provide medical grade oxygen. Understanding what, if any warranty is remaining on the unit. Most warranties are only valid through the retailer that sold the product. Any unit bought on a third party website (Craigslist, E-bay) will likely be without any warranty. Make sure you can try the unit before you buy. Even the “best” deal is a bad deal if the equipment does not meet your medical needs. Here at the Oxygen Concentrator Store by American Medical we sell used home and portable units that are fully cleaned, tested and inspected. We’re transparent about a unit’s pre-owned condition and history so you know exactly what you are purchasing. All of our gently used units are Quality Assurance tested and detail cleaned to fit our “like new” standards. We test all gently used batteries to ensure that meet a minimum battery life BEFORE shipping to a patient. With our support team you get one-on-one service that’s essential to the buying process. Interested in purchasing a gently used unit? If purchasing a gently used unit or renting doesn’t interest you there is still an option available for the budget conscious patient. In addition to the Oxygen Concentrator Store’s standard payment options of cash, credit cards, and wire transfers, weuse PayPal Credit as a financing option for our customers. Whether it’s a tank or concentrator for your oxygen therapy needs, make sure you’re getting the right unit for you! While a tank might seem like a great and insured solution, the bulkiness, lack of mobility, upkeep, weight, lack of FAA approval, and more are all important factors to take into account. If price is a concern, we offer gently used units for sale and even rent our concentrators! We’re also proud to offer a rent-to-own program and easy financing solutions for qualified applicants. If this article still didn’t answer your Medicare or Insurance questions regarding oxygen concentrators see the Frequently Asked Questions or leave a comment below and one of our certified oxygen specialist will get back to you!